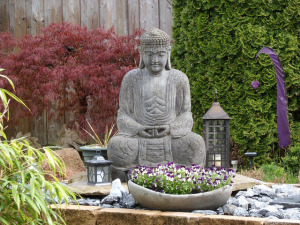 If you’re looking for something unique to refresh your yard and your soul, why not put in a zen garden? Buddhist monks created this type of garden in the past to allow them to become one within a spiritual outdoor space. With the right blend of rocks, harmony and extras, your space can be just as harmonious as the spaces the monks put together for themselves. Bringing together the natural elements of the outdoors is the trick when it comes to creating a zen rock garden of your own. You just have to know how to put them together to really make a statement in your yard. Having a clean variety of stones and rocks put throughout the area gives it more texture. Use big and small, rough and smooth rocks to boost the appeal in each place. The larger sized rocks can be used to sit on and reflect on yourself within the garden that you put together. While the sizes are good, it is also important that you have a good mix of colors. Try not to go bold and bright, but rather incorporating natural colors into the backyard scene. The right mix brings harmony to the garden and its surrounding yard. Adding in some Japanese-type foliage plants throughout your rock garden can boost the color scheme a bit more, without being over the top. You want this to be a tranquil, relaxing place, so adding green plants can bring more harmony to the area. You can even add a little color – consider plants with colored leaves, flowering trees and shrubs, or even smaller bamboo plants that are beautiful to look at but easy to care for as well. Whatever you decide to do, make sure that you do it the way that fits the best in your yard and is in harmony with your home. You want something you’re going to be proud of but also that speaks to you. When it’s time to refresh your landscape, give us a call. We are able to create a beautiful zen rock garden with your ideas, and together we’ll put our design in motion. We can provide some of the most beautiful rock work that will truly make your rock garden stand out. For some zen garden inspiration, visit us in Pinterest. If you see an idea you like, give us a call and let’s talk. We offer free in-home initial design consultations, so what have you got to lose?